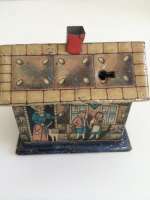 Penny toy still bank "Hans and Gretel Haus"Tinplate. Penny toy . Ca 1920. Germany. 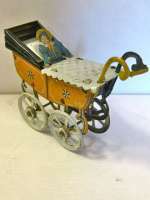 Penny Toy.Baby carriage made by Fischer,Germany. 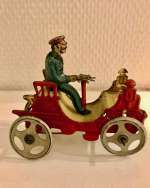 Penny Toy carriage of tin plate made Fischer,Nürnberg.Child inside Made around 1915. Very good condition..L= 3,5 inch - 9 cm.Literatur: David Pressland, Penny Toys, New Cavendish Books, London 1991. Penny Toy. 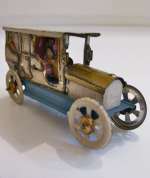 Early Car made by Distler,Germany. Vis-a-vis Bil med chauffør fremstillet af firma Meier,Tyskland. Bilen er fra ca 1915. Flot stand. L=7,5 cm. Se David Pressland,Penny Toys,New Cavendish Books, London 1991. 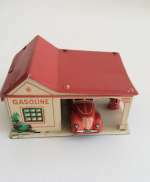 Penny toys Esso patrol station with pump and car. Penny toys Esso patrol station with pump and car. FIne lithgraphed. G. Fischer - made in Germany ca 1940 Size: D. 5 cm/ 2". W. 7 cm / 2- 9/10" Excellent condition. Antique rare Antique Dexterity Game.Yogi firma Marx . "Optical" toy. 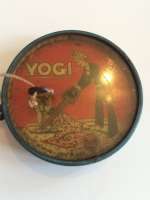 Rare Yogi "optical" toy by Marx The mechanism which is similar to that of a camera shutter, produces an optical illusion, with an east Indian man appearing to chop the head off a Fakir. The Fakir’s head is on a long sheet steel neck which is inserted in a slot on the front of the toy. The lever on the side of the toy is depressed and hey presto the sword appears to cut effortlessly through the Fakir’s steel neck. But how does the sword pass through solid steel? This toy was expensive to produce and no more were made after world war two. Excellent condition. Size: across 5,2 cm. Antique Dexterity Games: Embossed Tin Monkey, whre you try to place his 4 pearl teeth right. ca 1890. Across 5 cm. ( 2") .Dexterity puzzles - also known as palm puzzles - have been a source of fascination for adults and children since the Nineteenth Century.